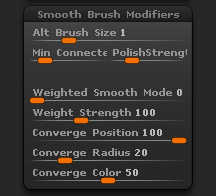 The Brush > Smooth Brush Modifiers sub-palette provides controls for the Smooth brushes. The Alt Brush Size will change the brush size when shift is held down during smoothing. The Min Connect Points slider will affect the number of points to apply a smoothing. The brush size will work in conjunction with this setting. If the slider is set higher there will be less smoothing applied to the mesh even with a large brush size. If the brush size is set to 1 then only one point is needed to evaluate the smoothing. The Polish Strength slider will control the alternate smart smooth brush strength when ALT is first pressed and then let go. A higher number will take longer to smooth out the mesh, but keep in mind this will have a slow reaction on a model with high poly counts. The Weighted Smooth Mode will change the interaction of how a smooth brush effects the surface. There are 7 new modes with a Weight Strength slider to control the strength of the mode that the smooth brush is in. 2. Valance-Will give more weight were the mesh has more polygons meeting at one point. For example, if there is a point that has 5 faces sharing that point it will receive more smoothing weight then a point that is sharing 3 faces. 3. Subdiv- Will smooth the mesh with same algorithm that is ran when you subdivide a mesh in ZBrush. 4. Stroke Direction- This will smooth the mesh along the stroke direction only. This is a great way to smooth out your last stroke but not loose a lot of the surface detail. 5. Perpendicular To Stroke Direction- This will smooth the surface detail perpendicular to your brush stroke. 6. Groups Border- This will smooth the mesh but respect the borders of the groups to maintain that line along the border. 7. Creased Edges- This will maintain the creased edge when smoothed out. The Weighted Strength slider will control how strong the smooth algorithm will react to the surface for each mode. The lower the number the smooth will be less effective on the surface. This slider only works with the Groups Borders and Creased Edges mode. The Converge Position slider will control the position of intersecting ZSpheres when in sketch mode. When a sketch stroke is drawn ontop of another sketch stroke the zspheres will be pushed into the underlaying surface based on this slider. If the slider is set to 1 then the Zsketch stroke will be pushed into the underlaying stroke at 100% strength. If the slider is set to 0 then the ZSketch stroke will not be pushed into the underlaying stroke at all. The Converge Radius slider will control the radius size of intersecting ZSpheres when in ZSketch mode. The radius will be adjusted at intersecting ZSpheres. If a smaller ZSphere sketch is applied to a larger ZSphere then the end radius of the smaller sketch will be set to match the size of the intersecting ZSphere. If the slider is set to 1 then the ZSketch radius will be sized to fit the connected large ZSphere. If set to 0.5 then the radius will only be sized to 50% of the size of the larger ZSphere. If the slider is set to 0 then the ZSketch radius will not be changed at all. The Converge Color slider will control the amount of color that will be blended at connecting ZSpheres. If the slider is set to 1 then the Zsketch stroke will blend both ZSphere colors with a large gradient. If the slider is set to 0 then the ZSketch stroke will apply no color change to any ZSpheres when smoothing.